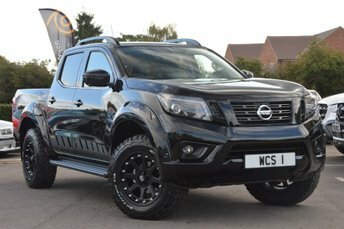 Metallic Twilight Grey, £29,714+VAT - IN PHYSICAL STOCK NOW '68' REGISTRATION READY TO DRIVE AWAY- FANTASTIC WCS DESIGN NP300 NAVARA IN TOP FACTORY SPEC AND FITTED WITH OUR DESIGN TRAIL PACKAGE EXTERIOR STYLING, WIDE ARCH KIT AND MOUNTAIN TOP ROLL. 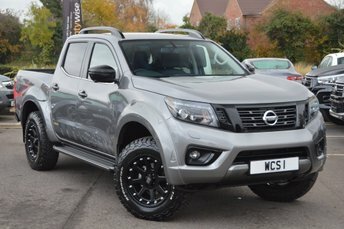 WITH 5 YEAR WARRANTY BLACK AND GREY AVAILABLE FROM STOCK PLEASE SEE OUR WEBSITES - WWW.WCSDESIGN.CO.UK AND WWW.WOODSTOCKCARSALES.CO.UK FOR FURTHER IMAGES OF THIS VEHICLE PLUS DETAILS OF OUR FAMILY BUSINESS BASED ON THE A40 AT EYNSHAM, WITNEY, OXFORDSHIRE. PART EXCHANGE WELCOME, FLEXIBLE FINANCE PACKAGES AND WARRANTY UPGRADES AVAILABLE SUBJECT TO STATUS - PLEASE NOTE SPECIFICATION MAY VARY FROM THESE STOCK IMAGES, PLEASE CALL FOR EXACT SPECS ON NEW VEHICLES, Upgrades - 20' WCSDESIGN WIDETRAK ALLOY WHEELS AND COOPER TYRES, SATIN BLACK ROLLER SHUTTER AND ROLL BAR, WCSDESIGN COLOUR CODED WIDE ARCH BODY CONVERSION, BLACK PACK INCLUDING FULL EXTERIOR DE-CHROME, PRIVACY GLASS, MATT BLACK DECAL PACKAGE (OPTIONAL), SATIN BLACK REAR BUMPER, GLOSS BLACK ROOF RAILS, BLACK SIDE STEPS, ABS LOAD LINER, FULL BLACK LEATHER, HEATED SEATS, ELECTRIC SEATS, 360 CAMERA, SAT NAV, DAB RADIO, 1 owner, Black Full leather interior, 4x4, Standard Features - Satellite Navigation, Around View Monitor with Rear Parking Sensors (x4), Automatic AC + Dual Zone + Pollen Filter + Rear Ventilation, Cruise Control, DAB Radio, Heated Front Seat, Alarm, Alloy Wheels - 18In with Locking Wheel Nuts, Bluetooth Audio Streaming with App Integration, Front and Rear Electric Windows, Hill Start Assist (HSA), NissanConnect 2.0 Entertainment System with Radio/CD/Aux Socket for MP3, On Board Computer, Rear Privacy Glass, Upholstery - Graphite Leather. 5 seats, PLEASE SEE WWW.WOODSTOCKCARSALES.CO.UK FOR FURTHER IMAGES OF THIS VEHICLE.